If you haven't heard 13th Track Halloween Radio or listened to the music of Nobody Records then your missing the best part of Halloween. Read along and check out the links as we interview Mark Harvey, the Master of Music Macabre! Q: The 13th Track is the Premiere Halloween Radio Station. Why Halloween? A: Halloween is my favorite holiday. For years I would put together mixes of Halloween (and Christmas) music and give it to friends. A sort of music to live your holiday by. As the years went on I started collecting anything and everything Halloween audio related. As my collection grew I decided I wanted to share my collection with a broader audience so I started 13thTrack.com Halloween Radio. Q: Your collection of Halloween related songs is staggering, how long have you been collecting them? Do you have a favorite find? Is there a favorite song associated with Halloween? A: I've been collecting Halloween related audio for around 22 years (I'm 34 now). My favorite find is a recent one. I finally located The Munsters LP in excellent condition. This LP features the Munsters theme with lyrics. Of course now that I found one, they've been showing up left and right on eBay. It'd be tough to pick just one favorite song since I've got so many. I'm into the more fun, party side of Halloween music. Music that is good to dance to. Something to get the girls dancing! Q: You split your record selections for the 13th Track between classics (pre-70s) and modern (post 70s), in your opinion was there a shift in the music at that time? Where do you see Halloween music headed in the future, will it be darker, more Culdee or could there be another "Monster Mash" looming on the horizon? A: There seems to be a shift from the pre-70s to the post 70s. Music from the 70s fits better with newer music. Music from the 60s and earlier tends to fit together. I've been DJing for many years and figured that 70s and before and 70s and beyond would be the logical place to split the broadcasts. Earlier Halloween music tends to be more whimsical, while newer Halloween music a bit darker (not in all cases). As far as the future of Halloween music? I think musicians will continue to record whatever inspires them. I know there are lots of new whimsical Halloween tunes, but with society getting a bit darker I also feel that Halloween music will emulate what's going on, so it should also get darker. Really, people record for whoever they think their audience is, even if it is just for themselves. When I record my music I record the music for myself and hope that there is someone out there that can relate to what I'm doing. So far so good. As far as another "Monster Mash" on the horizon, I doubt it. Songs like that one come around once in a lifetime. Of all the emails I get, "Monster Mash" is still the most requested song. I'm still trying to write a song that rivals it. Hopefully someday I'll succeed! Q: Nobody Records is a unique name, oft times there is a special meaning linking the name to the owner is it so in your case? How long has Nobody Records been in business? Where are you located? A: Back in the late 80's my band, The Screaming Paisleys, needed a record label name to release our debut LP "EXIT" on. I had a band mascot (if you will) that I called Nobody - a no eyes, nose or mouth doll. I liked the name and it seemed to fit and it has stuck now for 16+ years. The label is located in Northern California near Oakland. Q: The artists on your label are truly talented, how do you find them or do they find you? Do you solicit material from new acts or do you create them? A: I've found most of the artists on my label. I do accept unsolicited material and I've signed acts who've submitted demos. Much of what is on my label has some connection to me - either I am the band or part of the band or good friends with the band. My goal is to be able to someday add many more artists to the label and get affiliated with a major label. Q: Have you been associated with providing music for the dark ride industry? If so, in what fashion? A: I've created many custom tracks for the dark amusement industry. People from all over the world contact me for specialized tracks. It helps that I am a haunter and dark rider. I understand what it takes to put on a good show. Music, in my opinion, is the least considered, but the most effective aspect of any dark attraction. I like to see floor plans, understand the themes or gag in each space. Then I create a track that immerses the visitor in the desired location. Right now I am working with a dark ride company in the Middle East. Another goal of mine is to work for an amusement company putting together tracks for rides, theme parks and events. Q: Do you do anything special for Halloween such as parties, haunts or charitable functions? A: Yes. Each year I put on a haunt for children called "Pumpkinland" (named after my CD series). Children enter free and I collect canned goods or small donations for an entrance fee from the adults. All proceeds benefit the Davis Street Community Center in San Leandro, CA. Last year I wasn't able to put "Pumpkinland" together, but plan on getting it back up and running this October. I've got many new pneumatic props (built by Brent Ross, Devious Concoctions) and look forward to putting on a professional show for the kids this year. Q: Is there a special Halloween memory that remains with you? A: Yes. Trick or Treating as a kid. I have many fond memories of combing the hillsides in San Carlos, CA with my friends in search of candy and good scares. It was safe back then to wander around until all hours of the night with your friends. We'd come home with pillow cases full of candy. 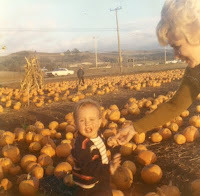 I also loved carving Jack-O-Lanterns, visiting Half Moon Bay, CA and decorating the house for Halloween. The new fond memories of Halloween include meeting Rob Zombie, Karen Black, Bill Moseley and Alyson Hannigan at Universal Studios. They all did radio spots for 13thTrack.com Halloween Radio and received copies of my Pumpkinland CD and my band, Rain Station's CD, DARK RIDE. I also enjoy visiting local haunts and hearing the tracks I've created for them in action. And that's it folks...repost du jour...hope you enjoyed it and keep visiting Mark Harvey World each day during the month of October.